فرآیند اصطکاکی اغتشاشی یک روش بهسازی سطح است. این فرآیند برای اصلاح ریزساختار و بهبود خواص مکانیکی و همچنین تولید کامپوزیت سطحی توسعه یافته است. هدف از انجام این پژوهش تولید نانو کامپوزیت سطحی زمینه مس با ذرات تقویت کننده SiO2 به روش فرآوری اصطکاکی اغتشاشی برای بهبود خواص مکانیکی است. در این مقاله از سرعت پیشروی ثابت 56 میلیمتر بر دقیقه و از سرعت‌های دورانی 500، 710 و 1000 دور بر دقیقه بهره گرفته شد. نمونه بهینه با در نظر گرفتن نتایج ریزساختاری و بالاترین خواص مکانیکی انتخاب شد. ریزساختاری نمونه‌ها به وسیله میکروسکوپ نوری (OM) و میکروسکوپ الکترونی روبشی (SEM) مورد بررسی قرار گرفت. نتایج نشان دهنده این است که با افزایش سرعت دورانی اندازه ذرات افزایش و در نتیجه سختی کاهش می یابد. بیشترین سختی به دست آمده، مربوط به نمونه تولید شده‌ با سرعت دورانی 500 دور بر دقیقه و به میزان 121 HV و با کمترین اندازه دانه 10 میکرون در ناحیه اغتشاشی است. همچنین خواص کششی نمونه‌های تولید شده به وسیله آزمون کشش بررسی شد. نتایج آزمون‌ نشان دهنده‌ آن است که استحکام کششی فلز پایه و کامپوزیت سطحی تولید شده به ترتیب 218 به227 مگاپاسکال به دست آمد. در نهایت خواص سایشی کامپوزیت سطحی مورد بررسی قرار گرفت. نتایج آزمون سایش˓ بهبود رفتار سایشی کامپوزیت تولید شده را نشان می‌دهد. Friction stir processing (FSP) is a method for improvement surface. This process development for refinement of microstructure, improvement of materials mechanicals properties so production of surfsce composite. The aim of article product metal matrix composite (MMC) on surface of copper sheets by means of SiO2 refinement by friction stir processing for improve mechanical properties. In this article travel speed was fixed and56 mm/min and rotationals speed were 500, 710, 1000 rpm to sue. Optimum sample selected due to microstructure resualts and highest mechanical properties. Microstructure resualts reported by optical and scaning electron microscopical. Resualt indicating via increase rotational speed, increase size and decrase hardness. Maximum hardness related to specimen whit rotational speed 500 rpm, and 121 Hv, least size 10µm. so tensile properties statement white standard tensile test. Resualt of mechanichal surface composite were about on 218 to 227 Mpa respectively. At last wear properties of surface composite were investigated. The resualt of wear test exhibiting better wear behaviour of the developed composite. Surekh, k. and Els-Botes, A., “Development of high strength, highconductivity copper by friction stir processing,” Materials and Design, Vol. 32, No. 3, pp. 911–916, 2011. Woo, W. choo, H. Prime, M. B. Feng, Z. and Clausen, B., “microstructure, and residual stress in a friction stir processed AZ31B magnesium alloy,” ActaMateriala, Vol.56, No. 8, pp. 1701-11, 2008. Mishra, R .S. and Ma, Y. Z., ”Friction stir weldin and processing, “Materials Science and Engineerin, Vol. 50, No. 1, pp. 1–78, 2005. Degischer, H. p., “Innovative Light Metals: Metal Matrix Composites and Foamed Aluminium”, Materials & Design, Vol. 18, No. 5, pp. 221-226, 1997. Heidarpour, A. Ahmadifard, S. and Kazemi, Sh., “Fabrication and Characterization of Al5083/Al2O3 Surface Nanocomposite via Friction Stir Processing”, Journal of Advanced Materials and Processing, Vol. 5, No.2, pp. 11-24, 2017. Ahmadifard, S. Kazemi, Sh. Heidarpour, A., “Fabrication of Al5083/TiO2 surface copomsite by friction stir process and investigating its microstructural mechanical and wear properties”, In Persian, Modares Mechanical Engineering, Vol. 15, No. 12, pp. 55-62, 2015. Mishra, R. S. and Mahoney, M. W., “Friction Stir Processing: a New Grain Refinement Technique to Achieve High Strain Rate Superplasticity in Commercial Alloys”, Materials Science Forum, Vol. 507, pp. 357–359, 2001. Xie, G. M. Ma, Z. Y, and Geng, L., “Development of a ﬁne-grained microstructure and the properties of a nugget zone in friction stir welded pure copper”, Scripta Materialia, Vol. 57, No. 6, pp. 73–76, 2007. Akramifard, H. R. Shamanian, M. Sabbaghian, M. and Esmailzadeh, M., “Microstructure and mechanical properties of Cu/SiC metal matrix composite fabricated via friction stir processing”, Materials and Design, Vol. 54, No. 1, pp. 838-844, 2013. Barmouz, M. Besharati Givi, M. K. and Seyfi, J., “On the role of processing parameters in producing Cu/SiC metal matrix composites via friction stir processing: Investigating microstructure, microhardness, wear and tensile behaviour,” Materials characterization, Vol. 62, No. 2, pp. 108–111, 2011. Barmouz, M. Asadi, P. Givi, M. K .B. and Taherishargh, M., “Investigation of mechanical properties of Cu/SiC composite fabricated by FSP: Effect of SiC particles size and volume fraction”, Materials Science and Engineering, Vol. 528, No. 3, pp. 1740−1749, 2011. Avettand-Fenoel, M. N. Simar, A. Shabadi, R. Taillard, R. and de Meester, B., “Characterization of oxide dispersion strengthened copper based materials developed by friction stir processing”, Materials and Design, Vol. 60, No. 2, pp. 343–357, 2014. Raju, L. Suvarna, and A. Kumar., “Influence of Al2O3 particles on the microstructure and mechanical properties of copper surface composites fabricated by friction stir processing”, Defence Technology, Vol. 15, No. 2, pp. 1-9, 2014. Lee, W. B. and Jung, S. B., “The joint properties of copper by friction stir welding”, Materials Letters, Vol. 58, No. 5, pp. 1041–1046, 2004. Krishnan, K. N., “On the formation of onion rings in friction stir welds”, Materials Science and Engineering A, Vol. 327, No. 2, pp. 246-251, 2002. Mahoney. M. W. Rhodes, C. G. Flintoff, J. G. Spurling, R. A. and Bingel, W. H., “Properties of friction stir welded 7075 T651 aluminum”, Metallurgical and Materials Transactions A, Vol. 29, No. 9, pp. 1955-1964, 1998. Ma, Z. Y. and Mishra, R. S., “Development of ultrafine-grained microstructure and low temperature (0.48 Tm) superplasticity in friction stir processed Al-Mg-Zr”, Scripta Materialia, Vol. 53, No. 3, pp. 75–80, 2005. Su, J. Q. Nelson, T. W. and Sterling, C. J., “A new route to bulk nanocrystalline materials”, Journal of Materials Research, Vol. 18, No. 1, pp. 1757–1760, 2003. Su, J. Q. Nelson, T. W. and Sterling, C. J., “Friction stir processing of large-area bulk UFG aluminum alloys”, Scripta Materials, Vol. 52, No. 4, pp. 135–140, 2005. Mishra, R. S. and Mahoney, M. W., “Friction Stir Processing: A New Grain Refinement Technique in Commercial Alloys”, Materials Science Forum, Vols. 357-359, No. 1, pp. 507-514, 2001. Sato, Y. S. Kokawa, H. Enomoto, M. Jogan, S. and Hashimoto, T., “Precipitation sequence in friction stir weld of 6063 aluminum during aging”, Metallurgical and Materials Transactions A, Vol. 30, No. 2, pp. 3125-3130, 1999. Jata, K. V. Sankaran, K. K. and Ruschau, J. J., “Friction Stir Welding Effects on Microstructure and Fatigue of Aluminum Alloy 7050 T7451”, Metallurgical and Materials Transactions A, Vol. 31, No. 9, pp. 2181-2192, 2000. Ma, Z. Y., “Friction Stir Processing Technology: a Review”, Metal Material Transaction A, Vol. 39, No. 4, pp. 642–58, 2008. Sathiskumar, R. Dinaharan, I. Murugan, N. and Vijay, S. J., “Influence of tool rotational speed on microstructure and sliding wear behavior ofCu/B4C surface composite synthesized by friction stir processing”, Transactions Nonferrous Metal Socity China, Vol. 24, No. 4, pp. 95−102, 2004. Behavior”, Composites Part A: Applied Science and Manufacturing, Vol. 42, No. 5, pp. 1445–53, 2011. Khayyamin, D. Mostafapour, A. and Keshmiri, R., “The effect of process parameters on microstructural characteristics of AZ91/SiO2 composite fabricated by FSP”, Materials Science and Engineering A, Vol. 559, No. 9, pp. 217–221, 2013. 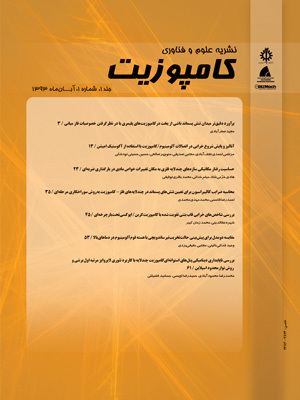 Ahmadifard, S. Shahin, N. Kazemi, Sh. Heidarpour, A. and Shirazi, A., “Fabrication of A5083/SiC surface composite by friction stir processing and its characterization”, In Persian, Journal of Science and Technology of Composites, Vol. 2, No. 4, pp. 31-36, 2016.